Marcos Tello (right) goes up against Jaymee Mandeville and Damian Windsor in Taste LA’s Cocktail Confidential. 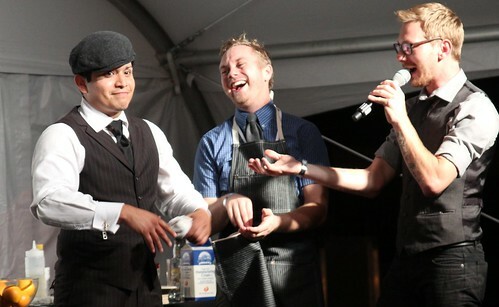 This past Saturday at The Taste LA Cocktail Confidential 2012, six of L.A.’s top bartenders brawled on stage. Only one of them could limp away winner of this cocktail competition judged by the very discerning palates of LA Times nightlife writer Jessica Gelt, master bartender Julian Cox and award-winning food writer Jonathan Gold. OK, actually it wasn’t exactly the most exciting event to spectate, no matter how hard its emcee tried. But it was cool to see bartenders Marcos Tello and Damian Windsor working alongside each other again. Don’t think I’ve seen that since their days at Seven Grand. And Drago Centro‘s Jaymee Mandeville up against them. While Ray’s and Stark Bar‘s Paul Sanguinetti shook off against The Parish‘s Brian Summers and The Vagrancy Project‘s Nathan Oliver. 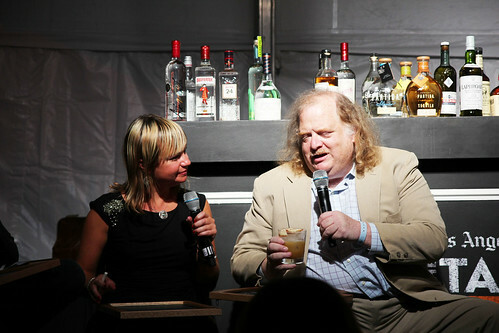 Judges Jessica Gelt and Jonathan Gold deliberate. 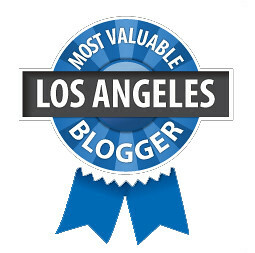 A crazy talented bunch for sure, with different approaches and varying backgrounds. It truly was anyone’s game. At the beginning of the event, Daniel of Thirsty in LA and I watched the contestants set up on stage. He wagered that Paul would win while I couldn’t help but note that Marcos strutted around like he knew he was going to win it. Turns out Marcos did win in this blind tasting which took him through two rounds. The first round, the contestants had to create a cocktail using two out of three mystery ingredients, and the second they had to create a cocktail to pair with Night + Market‘s uber spicy Thai spiced catfish. However, because the contest was so very uncompelling I left after the first round to go in search of food. By the time I returned, the judges were still deliberating over a winner. Banter, banter, heavy metal reference, banter. Finally, the winner of the contest was revealed: bartender #6, Marcos Tello (video). Marcos emerged on stage, triumphant. He went over his winning cocktails. The first called Midnight in the Garden of Good & Evil was made with a fennel-infused Partida Tequila Blanco, flash infused thanks to Marcos’ ISI charger. Apparently even though the contestants were told they couldn’t bring their own ingredients, they were allowed to bring their own equipment. Unfortunately, according to Paul, not many of them knew this. Marcos finished off his cocktail by infusing the rocks glass with cinnamon smoke! Talk about MacGyver-mixology skills. Marcos getting props from Brian Summers and Nathan Oliver. For the second round, Marcos’ cocktail inspiration arose from a basic need. “I needed a blended cocktail to ‘cool off’ my tongue from all the spice [from the Thai spiced catfish],” he said. A frappe of Flor de Cana white rum and Licor 43, his Day Trader cocktail sounded like just the thing to soothe the burn. If you’re like me and tired of just reading about these winning cocktails and want to taste them already, here are the recipes courtesy of Marcos for you to try at home. As a bonus, I was also able to snag Paul’s first round cocktail which he says he’s planning to put on Ray’s and Stark Bar’s upcoming fall menu in the next couple of weeks. FYI, if you aren’t the DIY type, Marcos has a new organic cocktail menu you can try out at Venice’s Feed Body + Soul sometime this fall. Shake with ice and strain into a rocks glass infused with cinnamon smoke (finely grind cinnamon stick and place in a smoke gun, ignite, & inject into glass). Garnish with a fennel stalk & cinnamon stick. Place all ingredients in a blender with 1 cup of crushed ice and blend until frappe. Garnish with one empty lime shell filled with Angostura bitters and lit on fire. Muddle plums in shaker tin with the rum and rye. Add remaining ingredients. Dry shake for 10 seconds. Shake with ice and strain into chilled cocktail coupe. Sprinkle with allspice on top of foam and garnish with fresh mint leaf and slice of plum.